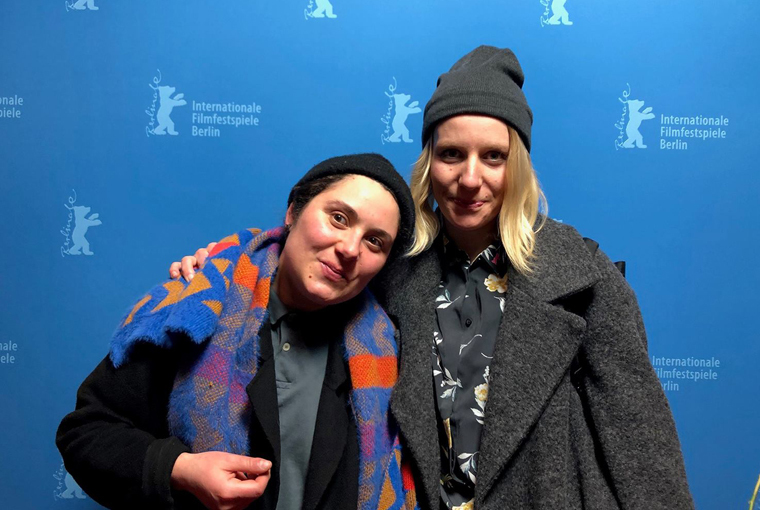 We met Hristiana Raykova at the Berlinale [pictured on the left, standing alongside her producer Genia Krassnig], where her German-produced documentary about a communal bath in Bulgaria screened in the festival’s section showcasing recent German cinema. 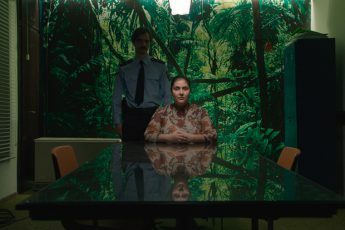 Raykova explains how she found her film’s setting and themes, how she settled on its aesthetics, and what it is like to film a predominantly male environment as a woman. How did you come to the topic of the film? I was born in this town, in Varna, and like all Varna citizens, everybody knows the pit. Many people say it’s not hygienic enough, it’s not controlled – there’s no legal control and no hygienic control. I was never interested in going there, I didn’t really care about it, but one day three or four years ago, I was back in my home town taking a walk and I saw the pit. It was as if I saw it for the first time, because I remembered it completely differently. In my memory it was just a small place in the sand with many stones around it. But then, three or four years ago, I saw this pool, a concrete pool directly on the beach with the sea behind it. It’s just endless and there is this horizon. There are a lot of people sitting there but you almost don’t see them because of the steam coming up from the water. The first thing I thought was “what a crazy and beautiful picture!” And I thought it could be a great stage for a documentary. Of course it’s not enough to have just the stage, I was hoping it was a place where you could really get a story and that’s how it was. I went to the people and I talked to them. They told me that it’s not just a pool, that it’s a place where they meet, where they talk about everything – about politics, about everyday life, about the tomatoes in their gardens, everything. They spend their free time there, they play cards. They were speaking about this place with so much pride and love, and they told me about how they take care of it. So I thought, great, there is a story and we have to research this place. It’s funny to hear you say that it has a reputation as being disgusting when it looks so beautiful in the film, especially in terms of the amazing colors. How did you come up with the visual concept? We were overwhelmed by the horizon, including the colors. Everything is so beautiful there! In the grading, we tried to stay as close as possible to the real thing. There really are these crazy colors, there really are these wonderful sunsets. Visually, we had two approaches. At times, we were following people with a handheld camera, and at others we made really static pictures while gathering impressions from the place. It was important to have the hand-held camera, since we wanted to stay close to our protagonists. We also wanted to show how great this place is, which is why we also wanted these very aesthetic shots of the pool. It definitely comes off as a magical community space, but a predominantly male one. Did you have any problems getting close to the people there as a woman? Yes, it is mostly men who go to the pool but there are also some women. It’s not only men, but there aren’t so many women and the women aren’t so active at the pool. We were looking for characters who were more active, which is why we only have male protagonists. Okay, I guess Alexander, one of our protagonists, is not so active, but he was so wonderful we had to include him anyway. But no, being a woman wasn’t a problem, or in any case not more than in any other situation. If you’re a little woman like me and you stand beside your tall camera guy, of course some men automatically assume that he’s the director and you’re the translator or something, so you have to make it clear and talk to them. It’s a macho society there, but I knew that and I was prepared. I don’t take it personally and it’s not up to me to teach people how to behave. It is like it is and I tried to make the most of it. But they were really warm people, and maybe some men don’t take you so seriously if you’re a woman, but on the other hand some are nicer to you. So there are plusses and minuses in this game. But of course it would be nice to always be taken seriously. Following on from that, you’ve lived in Germany for a long time now and you made it with a German crew, and at times some of the protagonists speak to you in German. Was that also something that helped you to form bonds with them? Yeah, for example, we met Alexander because he spoke German. He heard us speaking and went to meet the DOP just beneath the pool to talk to him, and that’s how we first met. It was really nice to have a protagonist that spoke German, because the camera operator doesn’t speak Bulgarian and it was really helpful for the chemistry between the three of us, or the four of us when the boom operator was there. It was helpful, but at the same time it wasn’t crucial. In this particular place, I was really surprised how many wonderful people go there. I was also surprised how difficult it was to get inside despite that. You have to gain the people’s trust and it was really difficult. People were warm and kind to us, but a lot of them were also afraid of us and what we would do with the movie. They were worried that we would present the pool in a bad light, so it was difficult to gain their trust and that made it harder to get inside the community than I had imagined. Have you shown the film to any of the protagonists since it’s been finished? 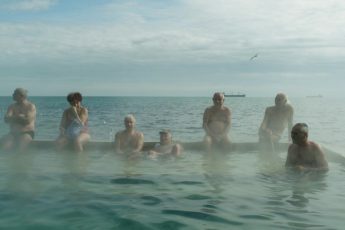 Yes, Dimčo, the taxi driver, and Bončo, the guy who gives a tour of the pool at the beginning – they saw the film two or three months ago, and they were guests yesterday [at the world premiere at the Berlinale], so they saw it on the big screen. Bobi was there too. Genadi didn’t see the film yet, so those are the only three who have seen it so far. I can imagine they must be happy with the way that the sense of community is represented, especially in terms of how they come together to take care of it and do everything themselves. I had no idea it was like this. I knew they took care of it, but I didn’t know there were ten people cleaning it. They do everything. They make different kinds of structures for the pipes, they think of different ways to arrange it so it can come out again easily. They develop such interesting and creative things. They improvise all the time because they don’t have money to do anything else. So at some point it became clear that this film deals a lot with improvisation and the talent of people who make the best out of the little that they have. That’s what I really liked about the place and the people. Did you already know when you started filming that there was a possibility that the pit would be privatized? I knew that the status wasn’t clear. I knew that it had been there for years, but I didn’t know there was such direct danger. One month after the beginning of our research shoot, we found an article in the media that said there would be a great change but they didn’t know what exactly. It could be privatized or they might start charging. It might be torn out. We weren’t sure what would happen, and neither were the people there, but we went back and tried to follow the process of activity. At the moment, the pool is still there and it’s just like it was. We’ll see. Maybe the change will come in a month or in a year, we just don’t know. The film spans quite a variety of topics. Are there any topics that you didn’t expect would be a part of it or were you open from the beginning? We were really open and we ended up with too many themes at some point, so we had to decide “are we talking about this issue or not?” In the end we had to cut it down. But there wasn’t anything too unexpected. I knew that people were generally not pleased with life in Bulgaria, and these people in particular. Many of our protagonists have to improvise to get on with their lives, like you’re 82 years old and you rent your house out like hotel rooms – that’s Alexander’s way of improvising, for example. It was clear that that would be the case, it was really a question of focusing and leaving some themes and issues behind. It was really long but our editor Kai Eiermann was so great. I think we spent almost one year with the editing. I always have the feeling that there’s one film that you can make with the material. One film has just one edit. There are many possibilities, but they’re not the possibility. I have the feeling that Kai did it so well although it was really challenging. We were still making changes in the last two days before it had to be ready – of course it had to be ready at some point – so that we could introduce the characters more smoothly at the beginning. Were you also shooting for a long time? We began in February 2016, and the last shoot was in February 2018. We had a lot of shoots – first the research shoot that lasted about one month, then we came back for another week to shoot the people’s activities. Then we were there for two weeks in the summer, then another two weeks in the winter and so on. We did it in blocks. Do you have any plans to make more films back in Varna? I still don’t know. I just have ideas for now and nothing on paper, but I usually like to pick a place or institution and find a story based on the people there. But I don’t know yet where my next film will be set at.